I cannot post a regular prayer letter at this time but did want to encourage you to pray for us. First, let me give you a link to a short movie presentation on our recent Nigeria trip. Keep praying that God’s work would grow there in that land. Secondly, please continue to pray for us as we seek to go to India in September. The team, times and flights are still not settled. Pray that each of us would be clear. Thirdly, keep praying for those I am dialoguing with. They often are from financially desperate, sexually confused, severely depressed situations. They need spiritual light and renewal. Fourthly, I want to thank the Lord for providing more for our family this year. Although it is about half what we might otherwise receive, we thank the Lord that our financial provisions are up this year. We are so thankful for this reprieve. 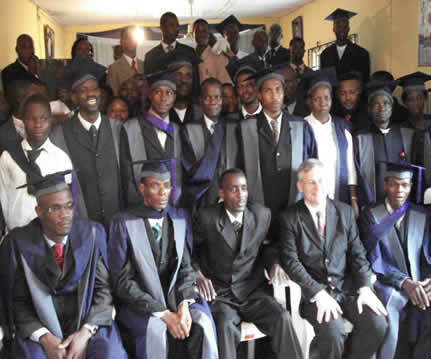 We also want to thank the Lord for always faithfully providing for our short term mission trips. We again will be raising more than $10,000 for India. Do pray! We really need the Lord’s constant help. Here is a special incident that shows how God provides for us. Not a few people wonder how we get by without a regular salary. We live life by faith taking care of our eight children (less two: one now older and one married) and encounter expenses for a ministry which must raise well over $15,000 each year for short term missions alone. Some say it is impossible. Others strongly suggest that we shouldn’t live that way as if it is wrong to trust God for supplying our financial needs. They say that we ought to have a regular income that provides all the needs of a typical family. I calmly tell such individuals that God has been supplying this way for eight years! We have many stories to tell but today we want to share a fresh new story about the special way that God cares for us. What just happened is another typical example of how God specially cares for us in our ‘impossible’ situation. I suppose there aren't many people that take long road trips in an eighteen year-old van with more than 185,000 miles on it carrying eight passengers inside. Our van is rusty in places, noisy and gobbles up the gas. We are thinking of down-sizing to an eight-seater (from twelve), but in the meanwhile it is what our Lord has given to us. We try to be content with what He has given. I introduce our van because the special story that I share today involves troubles that we recently experienced while driving it. One can use the above argument and suggest that we should not drive our old van on long trips, but we feel it is proper to visit our parents and good to take a family vacation. What just happened shows how God can and does help us even with our huge old '92 Ford gas-guzzling van. We were glad to visit our old home church, the one where Linda grew up in Lynn, Massachusetts. It was the same church we both attended when we married or were home on our furlough from missionary work in Taiwan. There are lots of fond memories and friends there. After church we headed to one of the old places that has some memories etched into it, Kelly's on Revere Beach. While driving there, suddenly the brakes went. That means that when I was trying to use my brakes they suddenly were not working. I put my foot on the brake and the van kept going! ￼We had just traveled over 600 miles in the past week. This could have happened anywhere. We could have been somewhere in the beautiful New York Pocono mountains–far from anywhere, or in line at a toll. The weather could have been scorching hot, or we could have been caught in a traffic jam when our van became undriveable. The van brakes went just before the corner where I was slowing down to take a left turn from my left lane. I didn’t need to stop for oncoming traffic and turned left. The bigger the vehicle, the harder to stop. We are glad that the Lord cushioned our stop with a little hill after the turn and a place to pull over. I quickly pulled out my cell phone and was about to search for a number but quickly put it down and said aloud, "Let's first pray." We prayed and entrusted our situation to the Lord. Several things immediately came to my mind. What was I going to do with my family? Is there a shop that can fix it on Sunday? Perhaps I can talk to my sister’s dad who lives nearby. I did not have his number but fortunately I found my sister’s number on the cell phone that I rarely use. So I called my sister to get his number. My prayer was not long, but it was evident that God had carefully arranged things. First, it is very difficult to get my sister to ever answer the phone but there she was on the line talking! I had not been able to reach her for several days as it was. ￼Second, she could reach her daughter, which she said was a near miracle, to help drive us back to her house. She said that she would contact her dad and give me a phone call back. 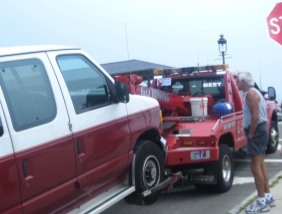 I do have AAA, a towing service, but did not know where to get towed to or a reliable garage to get it fixed. She called back and said that she could not get in touch with him. I was wondering, "Should I call AAA? Where would I tell the towing company to take the van to get fixed? I knew nothing of this place." This was Sunday and shops were not open. It is hard to get caught in a place away from home. While I was thinking all of this, I looked up toward the road that our short street intersected with. Could it be? It looked like my sister’s Dad walking along the sidewalk. I quickly got out of the car and went over to him and said, "You are just the person I was looking for!" He did not at first recognize me but did in a short moment. It was good to see him. The whole story is not over. Right now my van is in the shop, but we are back home with Linda's Mom up in New Hampshire. My kind sister allowed us to borrow her SUV. I will go back tomorrow to get the van. As a bonus, my sister had invited us for lunch. We had not reached the restaurant. She ‘just happened’ to have a ‘ton’ of stuff left from a party the day before. She was not being polite. My sister and her daughter brought out a 'ton' of stuff including deserts, meats, appetizers, various kinds of drinks, fruit, etc. It was like a big party. Chocolate covered strawberries, cheese cake, cheese and crackers all prepared. She said she really wanted us to help her clean out her fridge. We were glad we could help! Although the whole story is yet to be written, enough has been inscribed into history for us to have hearts overfilled with joy. My daughter Allison said that she was not surprised at all of this because she had recently seen God’s amazing work in her life. Is it wrong to run around the US in an ancient van? No. God takes care of us in a special way because we have a special need. He knows we trust Him to take care of us, and we and others around us see how God wonderfully provides. Our children see special things like this quite often. They see the wonderful works of God. Praise the God who so wonderfully works in our lives! One brother visiting us last month recently asked, "How is your van?" I replied, "Fine. Nothing special. Why?" He replied back saying, "We always like to hear the special stories that happen with that van!" Here is another one to add to the collection! Thank you so much for your prayers. They mean so much to us and become part of the wonderful process God accomplishes His wonderful and majestic will here on earth. Do keep praying for us as we persist declaring His truth in this new generation. Please remember our plans for India. There might be some changes and do not quite know how to handle them.